Visiting my German relatives was a whirlwind of touring castles, churches and farms along the Westphalian countryside. While I can’t remember the names of the castles or when the churches were built, I’ll never forget my cousins’ hospitality and the meals we shared. In retrospect, sightseeing was merely a pleasant way of passing time in between the real purpose of my trip: long meals and conversations at the kitchen table. 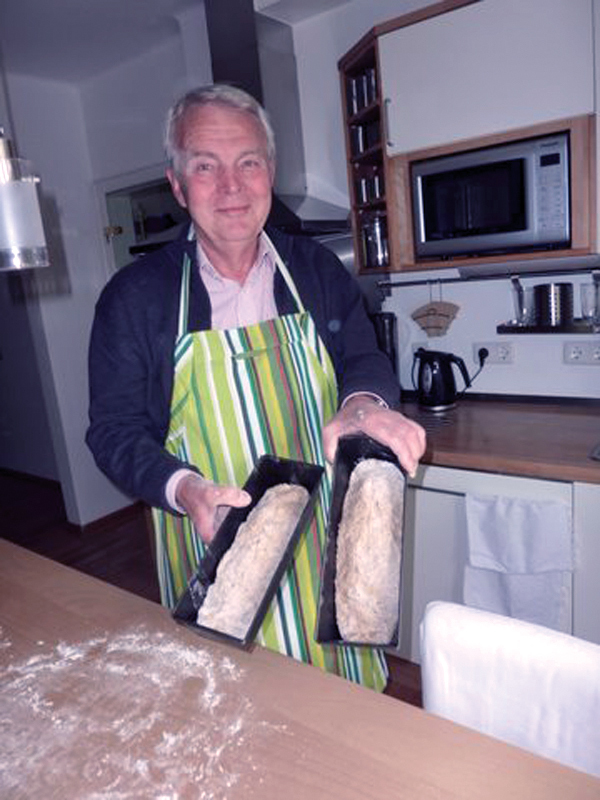 Karl-Heinz offers this advice for first time bread bakers: be patient. "You will have to work the dough over and over and you need time for the dough to rise. Look closely at the recipe and maybe the second time you try you will have a good bread." We breakfasted on delicious seeded bread with marmalade and Gouda cheese made in the neighboring Netherlands. For lunch we would have a perfectly crusted whole wheat bread dipped in steaming hot soup. Dinner might be a feast of beef and red cabbage served with yet another homemade bread. Bread wasn’t something I liked back home. I was born in the country that gave the world the Atkins diet. 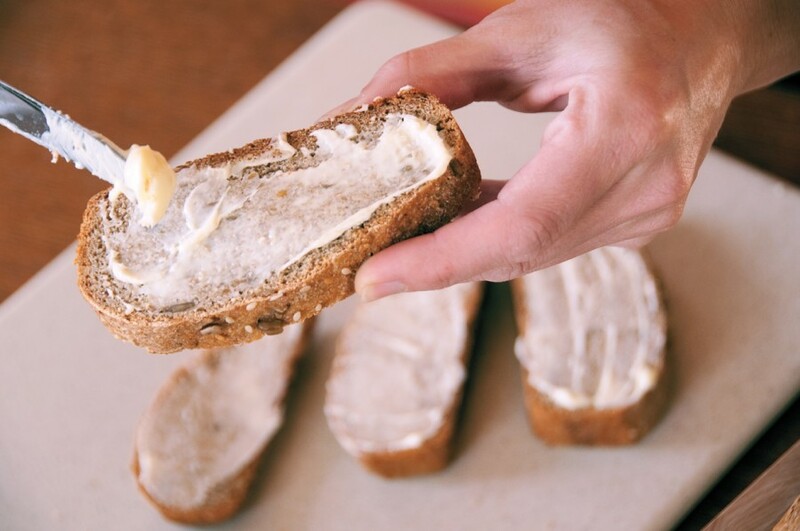 Throughout my childhood, bread came one way — spongy, white, and perfectly sliced from the grocery store. In my 20s I learned from the media and low-carb diet crazes that bread was not a healthy foundation for any meal. But then I visited Germany. On our first morning together, I sat down with my relatives to a meal of dark brown colored bread dotted with sunflower seeds. Because I knew it was laden with carbs I eyed it warily, but ate it like a dutiful guest. It didn’t taste unhealthy. It was nourishing and filling. My distant cousin, Karl-Heinz, is retired and that leaves time for his bread-making. Our families became acquainted when Ulrike, his daughter, was searching online for Hunhoffs in America and came across our South Dakota Magazine website. She e-mailed us, reuniting the Hunhoffs on both sides of the Atlantic after generations of separation. 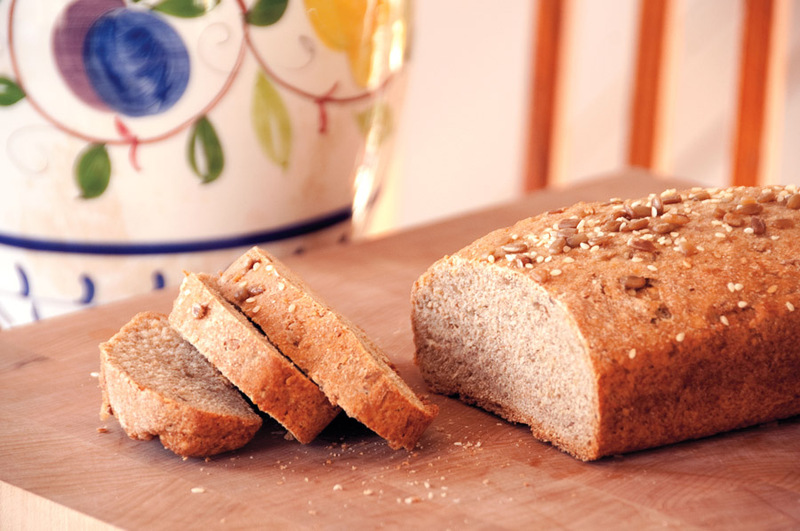 While we do have more than factory-baked white bread available in the United States, homemade, whole wheat breads are not a diet staple as they are in Germany, where families and neighbors exchange bread recipes and pass recipes from generation to generation. Today, the sharing is intercontinental: Karl-Heinz has began emailing me recipes, some centuries old. Here’s one of his recipes that is particularly good and fun to make. German bread is so flavorful, most don't need butter, cheese or any topping at all. 1. Put the flour in a bowl. In the middle of the flour make a hollow and inside the hollow place the yeast, sugar and 200 mL water. Stir the ingredients carefully with a fork and let the mixture rest for 10 minutes. 2. Mix in salt, yogurt, the three types of seeds and the other 200 mL water. Knead the dough for 5 – 7 minutes by hand on a lightly floured surface. 3. Let the dough rise in a warm place until it doubles in size — approximately one hour. 4. Knead the dough once more on a lightly floured surface for 5 – 7 minutes. Divide the dough equally into two buttered bread pans and score the top with a knife. Let the dough rise once more in a warm place until it doubles in size — approximately one hour. 5. Bake for 15 minutes at 350 degrees Fahrenheit followed by 45 minutes at 390 degrees Fahrenheit. (I covered the bread with tin foil after the first 15 minutes because it was already crusty). 6. Let the bread cool to room temperature before slicing. EDITOR'S NOTE -- This story is revised from the Jan/Feb 2011 issue of South Dakota Magazine. To order this back issue or to subscribe, call 800-456-5117. This bread looks good. I still haven't tried it! Hi, Great to see SDM Online! I was wondering if the recipe for Lefse from Dehydrated Potato Flakes is online somewhere. I know you published it a few months ago but since our move I've lost or misplaced that issue. I have all the equipment to make Lefse (heated pan, roller, lefse stick, etc.). Making Lefse from scratch is a real chore and quite frankly it's not worth all that effort to me. The recipe looked not so labor intensive so I'd like to try that way. Also, my Grandmother made a Potato Dumpling she called Klube. I have made that in the past and although it too is labor intensive, it doesn't spoil as quickly as Lefse. While browing through a World Foods market one day I found a package mix by a German Co., Kartoffeland, called Knodel and the picture on the label looked just like Klube. I tried it and it was great! That's what got me thinking about the Lefse. I hope you can post that recipe for me, it would be appreciated.